It’s not easy being different, but that’s exactly how Jabuti has felt for all of his young life. Smiling and laughing when all he feels inside is empty and sad. These emotions would defeat a lesser man, but he is made of sterner stuff. Not wishing to burden his fellow villagers with his troubles, there is perhaps only one man he can turn to. The shaman has been like a father and mentor to the orphaned youth. Seeking an audience with the wise old man, Jabuti sits before him full of trepidation. 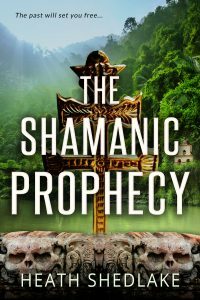 He is wise to be cautious, for what the shaman tells him on that fateful day will change his world forever. Heath Shedlake lives on the south-coast of the UK. Living by the sea provides the peace and inspiration to come up with ideas for his next project. In between writing assignments he can be found on the sea, either kite-surfing or paddle-boarding. As a complete departure from writing, Heath creates pieces of art from driftwood that can be found upon the beach. As if all that wasn't enough he has a troublesome old camper-van which he is slowly bringing back into pristine condition!